SunStone Pearl Pool Plaster Finish | Coronado's Pool Renovations, Inc.
SunStone Pearl smooth pebble pool finish takes any pool to new heights of dazzling luminescence. This unique new finish combines delicate hand-selected pebble aggregates with reinforced white Portland cement. 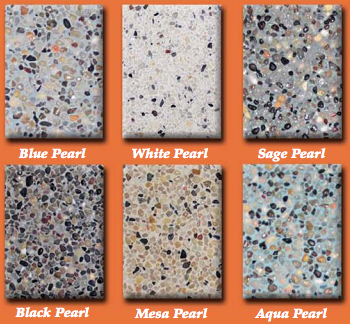 The result is a pool finish that feels as smooth as the surface of a precious pearl. Made with CLI’s most durable materials, SunStone Pearl’s 6 color combos, including Black Pearl and Aqua Pearl, provide a luxurious finish that will revitalize and soothe for years to come. As one of the most beautiful and time-tested surfacing formulas ever created, SunStone Pearl is a technological advance in natural beauty. The brilliance of a deep-sea pearl… right in your own backyard. That’s SunStone Pearl.